Afternoon Tea at a top London hotel was mighty fine, but my main reason for going up to our bustling capital was to learn more about using glass for food presentation. Friends of Glass is committed to promoting awareness of the benefits of using glass over plastic. As we know, plastic is the scourge of the environment and particles of it can now be found in every part of the globe, even Antarctica. Glass on the other hand, is reusable and 100% recyclable. Glass is also a healthier option. It is the most inert packaging material we have and thus highly impermeable making it far less likely to taint any food stored in it. I’ve long been passionate about using glass for storage rather than plastic and I have collected a lot of glass jars and containers over the years. Bring back the milk bottle and deposits for glass bottles I say. Last Thursday evening, a bunch of bloggers and journalists turned up at Cactus Studios, Michel Roux Jr’s cookery school, where incidentally, Saturday Kitchen is filmed. We were there to brush up our Christmas creativity using glass. What a delight to come in from the cold and dark to be greeted with a glass of warm mulled cider and a room glowing with candlelight and glass. As we chatted, we were served shot glasses of red pepper soup with pesto. The colours were fantastic and immediately I started to see the point of serving food in glasses. The colours and textures of the food really shine through and can make your dish look even more enticing. Not long after the soup, we were served cranberries and melted brie in the most adorable little glass jars that I coveted immediately. Bread sticks were cunningly placed in the metal clips. Here already, were two fabulous ideas for Christmas canapés, starters or pre-dinner nibbles. We were soon shepherded upstairs to the teaching kitchen to watch chef Bridget Colvin and BBC TV presenter Cherry Healey demo some further ideas. I really enjoyed this part; not only was Bridget knowledgable and competent, but the two made for a good double act. Spiced parsnip soup served in little glass jars with parsnip crisps was a winner which I will be replicating at some point during this festive season. Much ribald hilarity ensued whilst Cherry whizzed up some delicious pesto. The piece de resistance, however, was a pie in a jar. I’d not come across this concept before. The beauty of making individual pies this way, is not only do they look enticing, but they can be tailor made to suit individual tastes and tolerances. The demo was for a ham hock pie, but vegetarian ones had been made for Nayna of Simply Food and I and very delicious they were too. Layers of butternut squash, spinach, potatoes, shallots and peas with cheese sauce and a puff pastry crust all cooked and served in a clip top jar. What a fantabulous idea. A glass of wine made for a very welcome accompaniement. Feeling somewhat full, we were called over for the final demo: brandied clementines in a jar. This time we had to pay attention as this was the dish we were going to make. We were shown how to prepare clementines and I now know how to remove most of the pith easily. It’s the sort of thing that looks pretty and makes for a lovely gift, but not something I’d ever thought of doing. The vanilla brandy syrup we made tasted heady and decadent and would work well with most fruits I reckon – so that’s one of my Christmas presents sorted. Then it was back downstairs for mince pies and the final activity of the evening. An array of enticing edible delights were laid out in various bowls and jars and at last chocolate made an entrance. 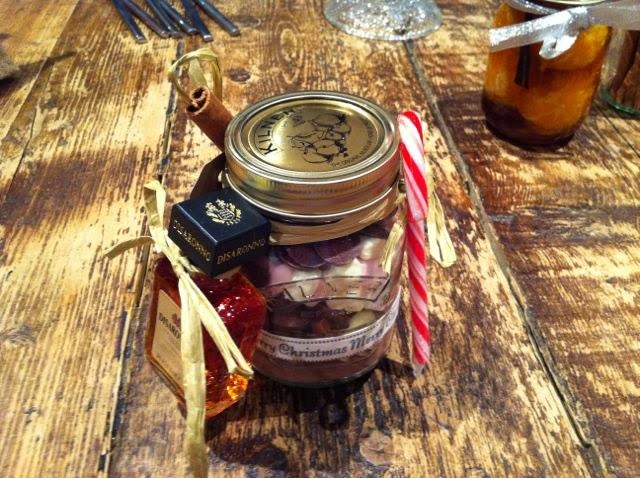 We were going to make up our own hot chocolate gift in a jar – what fun. We started with a layer of drinking chocolate and then it was a free for all. I added a layer of white chocolate buttons, followed by little fudge pieces. Milk chocolate buttons went next, then marshmallows and finally a layer of milk chocolate buttons. The part I really loved about this was tying on extras around the outside of the jar: a stick of cinnamon, a candy cane and my absolute favourite, a miniature bottle of Amaretto Disaronno found there way onto my jar. Finished off with a tag which I’d stamped with gold stars, this was the gift I was most pleased with. It came in very handy as a thank you to my friend for putting me up for the night. I have to say she was very impressed with it and thought it a lovely gift to suit both her and the children. Many thanks to Friends of Glass for a fun, friendly, entertaining evening, plus the bonus of leaving with some really nice Christmas gifts, including a jar of Rubies in the Rubble red onion & chilli chutney. I had a splendid time and would be very happy to do this all over again. You can see some far better pictures of the event than mine over at the Friends of Glass Facebook page. Wow. Very interesting stuff. I guess I learned something today. Must’ve been delicious fun. Thanks for sharing that. Delicious fun is a perfect way of describing the evening Shazza. Thank you. Isn’t it just Alison. I think we all enjoyed the evening, it was a good one. Ooh glass blowing sounds very brave. Do you have anything you’ve made? Impressed that Scotland keeps some of the old traditions alive – makes a lot of sense. I love the idea of presents and food in glass. What fun. I need to come with you next time. This was really interesting. I had never thought that cooking in a glass jar would be safe but those pies look great. Lovely idea to be copied at some stage for sure!! What a fun event. These are such clever ideas, and perfectly portable too! It was wonderful evening and such a lovely write up. I really enjoyed all the food and chatting to you too. Sounds like a great event. I do love goods presented in a glass jar. The pie is a great idea! I’ve served cold soup in shot glasses before and I love all the other ideas. Great post. I absolutely agree…..bring back glass bottles and jars with a deposit to be paid back on return. It definitely does wonders for presentation of food and has got to be better for the environment…..